For Canada users, in the Account Module, click New Claim, or double-click an existing claim to edit. To send electronic claims (e-claims), setup the ITRANS or Claimstream clearinghouse first. To troubleshoot claims, see Canada Claim Troubleshooting. If insurance requires student school and status, enter it on the Edit Patient Information under Name of School and Eligibility Excep. Code. The Canadian tab contains specific Canadian information. CDA Number or Identifier: Canadian Dental Association identifier of the referring provider. Reason: The reason why the referring doctor chose to refer the work related to this claim. Accident Date: Used to indicate that dental treatment was needed as the result of an accident. If a value is entered, the Is Accident field on the printed claim will automatically be marked. Trans Ref Num: When claim is sent electronically, this box is automatically filled with a unique transaction reference number composed of letters and numbers. To reverse or undo a claim, click Reverse. This button is only enabled when the claim has already been sent earlier that same day (determined by the existence of the Trans Ref Num). Materials Forwarded (email, correspondence, models, X-rays, images): Indicate the types of supporting documents which have been physically mailed to the insurance carrier. These boxes can be checked/unchecked independently. Treatment Required for Ortho: Only used for Ortho claims. If checked, the ortho flag is sent. Ortho Treatment (Predetermination Only): Only for predetermination claims, not regular claims. Estimated Treatment Start Date: The treatment plan date for the first appointment regarding this orthodontic treatment. Initial Payment: The amount the patient will pay out of pocket at the first appointment. Expected Payment Cycle (Months): Frequency of payments related to the orthodontic treatment. Accepted numbers are 1-4. 1 - Once a month. 2 - Every two months. 3 - Every three months. 4 - Every four months. Treatment Duration (Months): The number of months it will take to entirely finish the orthodontic treatment. Number of Payments Anticipated: Number of total expected patient payments for the orthodontic treatment. Anticipated Pay Amount: Total patient payment amount regarding the orthodontic treatment. Initial placement upper: For the upper arch only. Indicate whether the prosthetic work associated with this claim is or is not the first prosthetic, or if there is no prosthetic. Initial Date: If initial placement upper is set to No, then this date is required and is the date that the prosthetic was first added to the patient's mouth. Prosthesis Material: Describe the prosthetic material used for the initial placement. Required when initial placement upper is set to No. Initial placement lower: For the lower arch only. Indicate whether the prosthetic work associated with this claim is or is not the first prosthetic, or if there is no prosthetic. Initial Date: If initial placement lower is set to No, then this date is required and is the date that the prosthetic was first added to the patient's mouth. Prosthesis Material: Describes the prosthetic material used for the initial placement. Required when initial placement lower is set to No. Extracted Teeth: List of the patient's extracted teeth. For display only. Change the extraction status of teeth in the Chart Module. Missing Teeth: List of the patient's missing teeth. For display only. Change the extraction status of teeth in the Chart module. Enter the Claim Payment (By Procedure). Enter the Ins Pay amounts for each procedure. Click Write-Off to automatically calculate any write-off or lab fee payments (amounts in excess of the procedure's billed fee). This message will show. Click Yes. The Ins Pay amount for the procedure will revert to the Fee Billed amount, and any excess amount will be automatically applied towards a Total Payment line item when you close the Enter Payment window. Paid amounts will list under Ins Pay, unpaid amounts will be applied as a write-off. If you click No, since there are no write-offs, no changes will be made. Click Yes to apply procedure write-offs to the procedure and automatically create a Total Payment line item for lab fee write-off amounts when you close the Enter Payment window. Click No to apply procedure write-offs to the procedure only. Then close the Enter Payments window and manually enter a new (by Total) payment for the lab fee write-offs. You might also click No if there are no lab fees for the procedures (and thus no need for a lab fee write-off). You can enter multiple (by Total) insurance payments (e.g. one for each lab fee). When sending e-claims, both the treating dentist and billing dentist are submitted. If using the Canadian insurance carrier Sunlife, the treating dentist will receive the payment instead of the billing dentist. This is a decision made by Sunlife. When a non-preauth claim is sent and adjudicated electronically, a Transaction Reference Number is generated (see Canadian Tab above). Claim reversals require a valid Transaction Reference Number so that ITRANS and/or Claimstream know without a doubt which claim is being reversed. ITRANS/Claimstream do not allow claims to be reversed on any date other than the date they were originally adjudicated. If a claim needs to be reversed on a date later than the date it was originally adjudicated, then the claim must be reversed outside of Open Dental. Once reversed, it should then be manually deleted from Open Dental so that the patient account is accurate. Not all Canadian insurance carriers support claim reversal. If you attempt a claim reversal for a carrier that does not support reversal transactions, after clicking the Reverse button, Open Dental will display a message informing you that reversal transactions are not supported by the carrier. In some situations, a carrier may choose to reject a claim reversal even when the transaction reference number and reversal date are valid, and when this happens, the only way to reverse the claim is manually. When the carrier sends a response that manual printing is need (etrans AckCode M). When the secondary carrier does not support COB claim transactions. Responses can be reprinted later via the Edit Claim window by clicking History, Print. On each computer where claims are typically processed, set the default claim printer to a PDF printer. In version 14.1.6 and greater, the default claim printer is set in File, Printers, Claims. In File, Print, Claims, select the Prompt option. Then you will be prompted before printing begins and have the option to cancel the print job. See Printer Setup. To create a secondary claim, select the procedures, then click the New Claim dropdown, then click Secondary. The primary and secondary claims are processed when the primary claim is sent. The secondary claim will not list in the patient's account, but both primary and secondary responses can be viewed by printing the claim history of the primary claim. When the primary claim is sent electronically, a secondary claim is automatically created with status Waiting To Send. There are two electronic message formats for Canadian claims, version 02 and version 04. Secondary electronic claims are not possible for carriers that still use version 02 message format. Secondary claims will be sent electronically and automatically if the primary claim was sent to a version 04 carrier, the carrier accepts secondary claims, and an EOB has been received for the primary claim (EOB cannot be an acknowledgement or rejection). In any other case, secondary claims must be sent by physical mail. It is best practice to first create the primary claim and send it or print it before worrying about the secondary claim because sometimes the secondary claim will be created and possibly sent electronically and automatically. Open Dental does not support the electronic sending of secondary preauthorizations. The message format for electronic claims is designed to allow electronic attachments for carriers that support version 04 of the standard. As of the writing of this paragraph, no carriers are currently supporting electronic attachments. Open Dental will not be able to send electronic attachments through ITRANS until more carriers can accept them. The format is technically known as transaction type 09 and the response is known as transaction type 19. Claim EOB: Insurance paid amounts will automatically be entered on the Edit Claim window, though you will still need to finalize the payment. See Finalize Insurance Payment. Preauthorization EOB: Amounts will automatically be entered as estimates. 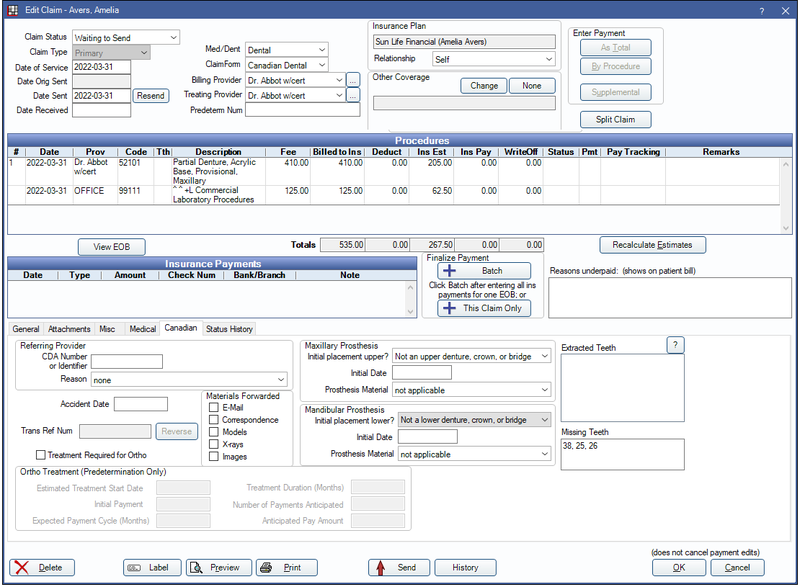 Automatic insurance paid amounts can be turned on/off in Claimstream Setup or ITRANS Setup. Claim acknowledgment report. This is not the same as an EOB. You will need to continue to check for claim results by clicking Outstanding on the Insurance Claims window. See, Send Canadian Claims and Retrieve Reports. You will eventually receive a rejection or EOB regarding the claim acknowledgment. Also see Canada Insurance Plans.